Welcome on Brussels Rotary Club website ! Our Club, together with the Ostend Rotary Club, is the oldest Rotary club in Belgium, both founded in 1923. Furthermore, with 110 members, we are the biggest Rotary Club in the Country. 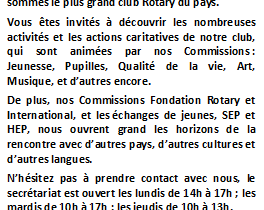 Furthermore, our Rotary Foundation and our International Commissions, together with our Youth Exchange Programs SEP and HEP, are sealing our Club relations with other Countries, other cultures, and other languages. Don’t hesitate to contact us on Mondays 2:00 to 5:00 pm; Tuesdays 10:00 am to 5:00 pm; Thursdays 10:00 am to 1:00 pm. Happy surfing on our site !